This analysis is limited to findings from the surveys 1/86, 2/86, 1/89 and 2/89. Cephalopods appeared in varying but generally small amounts in swept-area bottom trawl hauls. The sampling of the area Tombua to Benguela was particularly poor because of limited trawling grounds. The coverage of the areas Benguela-Luanda and Luanda-Cabinda includes a varying number of hauls on the slope, 200 to 600/800 m for testing of deep-sea shrimp and hake. The cephalopods along the Angolan coast can be grouped in accordance with two ecological regimes; that related to the waters of the shelf and upper slope (0 to about 200 m) and that of the slope and oceanic waters from about 200 m of depth outwards. The most important representatives inhabiting the shelf are cuttlefishes (Sepiidae); shelf squids (Loliginidae) and with much less abundance the octopus (Octopodidae). The commercially interesting representatives of the deeper slope and offshore waters are the flying squids (Ommastrephidae) with the genera Illex, Todaropsis and Todarodes. The behaviour of the cephalopods affects the results of the analysis that can be made of their appearance in the bottom trawl. The Loliginidae are known to undertake diurnal migrations, being bottom dwellers during the day and lifting into mid-waters at night. Whether or not the Sepiidae have a similar behaviour is uncertain, but the data to be analysed have been restricted to demersal hauls during daylight hours. The Ommastrephidae are also known to undertake diurnal migrations, being found in surface layers during the night where they often can be aggregated by light from vessels and at considerable depths during daytime, in mid-water or near the bottom. Their distribution may be related to that of the mesopelagic fish which has a similar diurnal vertical migration and has been recorded in abundance along parts of the Angolan shelf. It is doubtful whether the records of the catches of Ommastrephidae in the bottom trawl, even if limited to daytime hauls, provide much more than evidence on the presence of the species. Since, however, there is a commercial fishery for deep-sea shrimp on the trawlable grounds along the slope these records may be of some interest in showing the by-catches of cephalopods in this fishery. Another important feature of cephalopod biology is that a seasonal variation in abundance often occurs, an effect of a short life cycle, usually of about one year. The distribution in time of these surveys, is not favourable with reference to this phenomenon as it is limited to the first half of the year. The analysis of the cephalopods on the shelf is in the following restricted to day light hauls made at depths down to 200 m. At times these species were also recorded in small amounts in catches beyond this depth limit. Hauls beyond 200 m depth are analysed for Ommastrephidae. The degree of reliability and precision of the taxonomic classification of the cephalopods varied between surveys. Cuttlefish was often only identified to family or genus level, but in later surveys generally to species level including Sepia officinalis, S. orbignyana and S. bertheloti. There is some doubt about some of the distinctions between S. officinalis and S. bertheloti. Squid on the shelf was usually identified as Loligo vulgaris, but there are indications that Ommastrephidae on the slope were at times also identified as Loligo. Ommastrephidae species included shortfin squid (Illex coindetii), flying squid (Todarodes sagittatus) and lesser flying squid (Todaropsis eblanae). There were some uncertainties about the reliability of these identifications. A number of other cephalopod forms of little or no commercial interest appeared occasionally in the catches. They included the small sized African squid (Alloteuthis africana), the ornate cuttlefish (Sepiella ornata) and in the deep hauls representatives of the families Amphitretidae, Bolitaenidae and Lepidoteuthidae. The main forms from this shelf were: cuttlefish identified as Sepia officinalis in survey 1/89 and as Sepia bertheloti and S. orbignyana in survey 2/89 squid identified as Loligo vulgaris and common octopus identified as Octopus vulgaris. Octopus was found in a few catches only. The lesser flying squid Todaropsis eblanae was identified in survey 1/89 in small amounts in offshore catches. In survey 1/86 Todarodes sagittatus was identified as the species found up to 250 nmi offshore. This squid was observed in good numbers at the surface at night over a wide area, but catch rates in a few jigging trials were not high. Table 7.67 summarizes of the catch rates of squid (Loligo vulgaris) for each of the four surveys, with the mean rate in all day hauls on the shelf, the three highest rates and the rate of occurrence. It was found in about 50% of hauls in the two 1985 surveys and in 70% of the hauls in the 1989 surveys. The abundance seems to have been highest in April 1989. Interannual changes of abundance of squids are well known from other areas. The highest catch rates were obtained in the depth range 20–130 m with a mean of 65 m.
Table 7.68 shows the summarized catch data for the cuttlefish. Both the rate of occurrence and the catch rates were highest in April 1989. The highest rates were obtained in the depth range 20–110 m with a mean of 57 m.
An inspection of the distribution of the catch rates over the shelf for both the squid and the cuttlefish indicate that they may have a spotty character with areas of high density over the mid and inner shelf. Commercial rates are thus likely to be higher than the mean rates obtained in the hauls from the preselected positions in our survey, perhaps within the range of the highest rates. Over this part of the shelf cuttlefish appeared in the catches with rates as shown in Table 7.69, by far the greater part identified as S. officinalis with small amounts of S. orbignyana. In Survey 2/86 identification was only by genus. The highest catch rates were obtained in the depth range 60–120 m with a mean of 82 m. The depth distribution of the cuttlefish is thus fairly restricted. The highest abundance was found in April 1986 and April 1989 with hardly any occurrence in February 1989 and also low abundance in January 1986. In general it was, however, lower than on the Cunene-Tombua shelf. The shelf squids had low abundance in this part of the coast. Loligo vulgaris was recorded in very small amounts in only 6 of the 167 hauls of all the four surveys, while the small sized African squid (Alloteuthis africana) appeared in 25 catches. Table 7.70 shows the catch data for the Ommastrephidae in the slope hauls. An identification in 1986 to Loligo sp. is assumed to be incorrect. The highest rates were obtained within 200–460 m of depth with a mean of about 300 m. The deep part of the slope was, however, inadequately covered. Table 7.71 shows the catch data for cuttlefish. The highest catch rates were obtained in the depth range 50–110 m with a mean of 79 m. The rate of occurrence is low, 25–30%, but spots of higher abundance may exist. The 1986 data showed highest abundance. Table 7.72 shows a summary of the catch data for the ommastrephids from the slope hauls. The highest rates were from 200–500 m with a mean of 330 m. The rate of occurrence is high in some of the surveys. Deep-sea shrimps were included among the survey objectives from survey 4/85 onwards. There were special problems of uncertainty as regards the true catchability of the trawl for the various shrimp species and biomass estimates were accepted only as indices of abundance. Deep-sea rose shrimp, (Spanish: gamba, camarón de altura), Parapenaeus longirostris. This species is found in the upper slope, 150–350 m and represents a main target for the commercial fishery. Striped red shrimp, (gamba listada), Aristeus varidens, is found mostly in the depth range 400–600 m and also commercially important. Scarlet shrimp, (gamba carabinero), Plesiopenaeus edwardsianus, occurs in the range 400–900 m and is highly appreciated, but less abundant. Golden shrimp, (camarón de oro), Plesionika martia, occurs at 300–700 m, and is less common. African mud shrimp, (gamba de fango), Solenocera africana, at 50–300 m, less common. African spider shrimp, (camaron araña africano), Nematocarcinus africanus, at 200–700 m, is small sized, of little commercial interest, and abundant. Attempts at identification to genus or species were only made from survey 4/1985 onwards, but the records from this and several later surveys indicate various instances of apparent misidentification and these data were omitted from the analysis. The fishery for the rose shrimp is restricted to daytime, whereas the species in deeper waters apparently may be fished both day and night. The fleet may work the 200–300 m grounds during the day and the grounds 400–500 m and more during the night. The catches in the deeper waters often contain small sized shrimp, some times in large quantities in addition to the larger sized main commercial species which form the target of the fishery. These small sized shrimp are of doubtful commercial interest and have in the surveys often only been classified as “shrimp, small, non commercial”. Table 7.73 shows the mean catch rates in all hauls in the depth range, the three highest rates and the rate of occurrence measured as the number of hauls with catch rates exceeding 1 kg/h related to the total number of hauls made in that depth stratum. The number of hauls in each survey is not very high and the usually few high catch rates result in a high variance. The rate of occurrence is high in both regions. There was a decline of catch rates over the survey period. As regards the geographical distribution of the catches the highest rates on the grounds between Benguela and Luanda were in most cases obtained in the south between Lobito and Cabeca de Baleia, but some good rates were from scattered positions up past Cape Ledo. Between Luanda and Cabinda nearly all the highest catches came from the slope out of Luanda up past Ambriz, and also two from positions just south and north of the Congo River outflow. Table 7.74 shows the catch data from the surveys in which this species was covered. The data from 1986 and 1989 were based on relatively few hauls and only to 600 m depth while the more extensive survey in 1992 showed that the species is found down to 800 m (Anon., 1992). The catch rates showed a trend of decline also for the striped red shrimp. Scarlet shrimp has a distribution in the range 400–800 m and only the upper part of this was covered by the 1985–89 surveys. In the surveys of February 1986 and February and May 1989 the species appeared in hauls from 450 m and deeper in both regions with mean rates of 1 or 2 kg/h and a few catches ranging up to 15 kg/h. About the same rates were obtained in the 400–800 m range in 1992. Golden shrimp was recorded in the catches down to 550 m. As it is generally small sized it is uncertain to what extent it has been identified separately or grouped as “small-sized shrimp, non commercial”. African mud shrimp was recorded in many catches, but at very low rates up to a few kg/h between 80 and 400 m of depth. Very large catches of African spider shrimp were made in the depth range 350–550 m especially on the grounds between Luanda and Cabinda. In the January 1986 survey the mean catch rate for this region below 350 m of depth was 280 kg/h with maximum catches of 420 kg/h. In February 1989 catches ranged up to 1 t/h. The size was small, mean weight typically 3–5 g. Its soft body and the extremely long legs forming large entangled masses reduce the commercial interest for this species. These are likely to be underestimates especially for the striped red shrimp and the scarlet shrimp which have their main distribution deeper than 350 m where the coverage was incomplete. Furthermore, there is the problem of uncertainty regarding the true catchability of the trawl for shrimps, therefore the biomass estimates should only be used as indices. Using the mean catch rates obtained in the 1989 surveys the corresponding estimate of the total shrimp biomass is 3,300 t and for the 1992 survey about 2,600 t. There is thus an indication of a decline of one-third of the shrimp biomass between 1985/86 and 1989 and perhaps some further decline in 1992. A synthesis of the assessments of fish biomass by main groups, for the southern region Cunene-Namibe and the combined central and northern regions Benguela-Cabinda is given in Table 7.75. Among the small pelagic fish, the pilchard and the Cape horse mackerel represent resources which are shared with Namibia and the biomass estimates are indications of seasonal availability in Angola. The mean standing biomass of sardinellas and Cunene horse mackerel of 500,000 t compares with a mean annual catch of 230,000 t in the period which perhaps roughly indicates that these resources were fully utilized over that period. Data on fishing for Cape horse mackerel in Angola are not readily available, but a full utilization of that stock and of a recovered stock of sardine would raise Angola's potential annual yield of small pelagics to 300,000–400,000 t.
Angola's reported catches of demersal fish in 1991/92 were less than 20,000 (FAO, 1994). It is uncertain whether these data include all fisheries, but in general there seems to be room for expansion of the national fisheries in many directions. The surveys in general confirmed the high productivity of the Angolan shelf demonstrated by the history of its industrial fishery. Angola's position in the northern part of Benguela Current upwelling system determines the characteristics of both its fauna and its productivity and is parallelled in the southern position of Mauritania-Senegal-Guinea Bissau in the Canary Current system. Data for a comparison of the mean standing biomass and densities of Angola's pelagic stocks with the corresponding findings from the DR. FRIDTJOF NANSEN surveys in Namibia and of the shelf from Mauritania to Guinea Bissau in 1981, 1982, 1986 and 1992 (see Chapter 6) are presented in Table 7.76. The data seem to indicate that the densities per unit area of Angola and “NW Africa” are comparable, and considerably lower than in Namibia. However, the density per unit of coastline in Angola is considerably lower than in Namibia and NW Africa. Anchovies, round herring 184 0 0? Several coverages of the EEZs of Congo and Gabon were performed by the DR. FRIDTJOF NANSEN (Strømme et al., 1983; IMR 1985b, d, f; 1986b and 1986c). The first coverage took place in August 1981, as part of a survey of the offshore sub-surface community from Equatorial Guinea to the Congo River (Strømme et al, 1983). Because of technical problems and hence reduced survey time, the sampling intensity was very low (Table 7.77), which limits the usefulness of the results from this survey. In 1985 four seasonal coverages were performed, in combination with the surveys off Angola. The main objectives were to ensure a complete coverage of the small pelagic stocks shared by Gabon, Congo and Angola, and to provide information on the distribution and the abundance of the main demersal stocks. In 1989 two surveys took place in the first half of the year (January-February and May-June, respectively) with similar objectives as in 1985. However, the shelf north of Cape Lopez (Gabon) was excluded from the survey programme. In fact, as a result of the 1985 surveys, fish densities south of Cape Lopez were found to be several times higher than on the narrower shelf north of the Cape and, in agreement with Gabonese authorities, it was decided to limit the survey coverage to the southern region. Furthermore, the shelf between Cape Lopez and just north of Iguela was never covered because of ongoing oil drilling activities. Figure 7.24 shows an example of a survey track from the 1985 programme. A description of the hydrographic conditions found in the four 1985 surveys is presented in a summary report covering that survey period (IMR, 1986c). This account is largely based on that document. Fig. 7.25 shows the general circulation pattern of surface waters in the region. According to the results from the DR. FRIDTJOF NANSEN, two main hydrographic seasons can be distinguished, related to the austral summer (December to March) and austral winter (June to September) respectively. The region is dominated by the South Equatorial Current (SEC) flowing westwards from the African coast in the equatorial region. The northern, inshore branch of the SEC transports low-saline warm water from the Gulf of Biafra, southwest along the northern Gabon coast, to about Cape Lopez. The Congo Current flows northwards, transporting low saline water originating from the Congo River estuary. During the austral summer, it reaches as far north as Cape Lopez before turning westwards, while during the austral winter it is less coastal and has an offshore direction. A strong thermocline at around 20 to 40 m depth and a warm upper layer with temperatures between 26 and 30°C characterize the austral summer. This is the period of maximum rainfall resulting in low salinity surface waters, mainly due to the discharges of the Congo River and low-salinity water originating from the Gulf of Biafra. In winter, there is a marked decrease in surface temperatures (22 to 26°C), with lowest values in the inshore southern parts (off Congo) where upwelling seems to take place. This upwelling may be related to the changed direction of the Congo Current that flows westwards from the Congolese shelf. The shelf north of Cape Lopez seems to be under the influence of the shoreward branch of the SEC throughout the year. Voituriez and Herbland (1982) argue that the seasonal upwelling of this region does not seem to be wind-induced and that there is no real vertical transport. This upwelling might be due to increasing strength of the winds in the Western Atlantic originating a Kelvin wave along the Equator in a west-east direction. The shelf is a regular strip with an average width of about 40 nmi, strongly narrowing only off Cape Lopez. Figure 7.26 shows the bottom type as observed with the echo integration system during the four surveys in 1985 (IMR, 1986c). The shelf bottom is mainly smooth, and thus trawlable, with a few patches of rough/rocky formations mainly toward the shelf edge (150 to 180 m). These formations are fossil Holocene coral banks, characteristic of the tropical Eastern Atlantic. The shelf becomes very steep from about 120 m depth. Table 7.78 provides some information on shelf area by depth regions and length of coastline, for both countries. The results from the 1981 survey are presented in a report covering the regions from Togo to Cameroon and from Equatorial Guinea to Congo, respectively (Strømme et al, 1983). Four cruise reports cover the 1985 surveys in Congo and Gabon (IMR 1985b, 1985d, 1985f and 1986b). A report was produced summarizing the results from the 1985 surveys off Gabon (IMR, 1986c). Two cruise reports are available for the 1989 surveys (IMR 1989a and 1989b), each covering both countries. The biomass estimates for pelagic fish are based on the allocation of the integrator readings to two main categories: Pelagic fish type 1, including Clupeidae and Engraulidae (Sardinella aurita and S. maderensis, Ilisha africana and Engraulis encrasicolus) and Pelagic fish type 2, including various species of Carangidae (Trachurus trecae, Chloroscombrus chrysurus, Selene dorsalis), smaller Scombridae (mainly Scomber japonicus), barracudas (various species of Sphyraena) and the hairtail Trichiurus lepturus. The triggerfish, Balistes capriscus, was considered as a separate category. Species belonging to Pelagic fish type 1 prefer shallow coastal habitats (except maybe for S. aurita that is also found over the deeper part of the shelf), while Pelagic fish type 2 includes both species of shallow waters and of the deeper parts of the shelf. Allocation of integrator recordings to species groups is based on the composition in the catches and identification of the echo traces. Because of extremely low echo levels, at times it has been difficult to separate integrator values according to the above categories and only rough estimates including all species of pelagic fish have been calculated. In some cases, no estimate has been attempted at all. 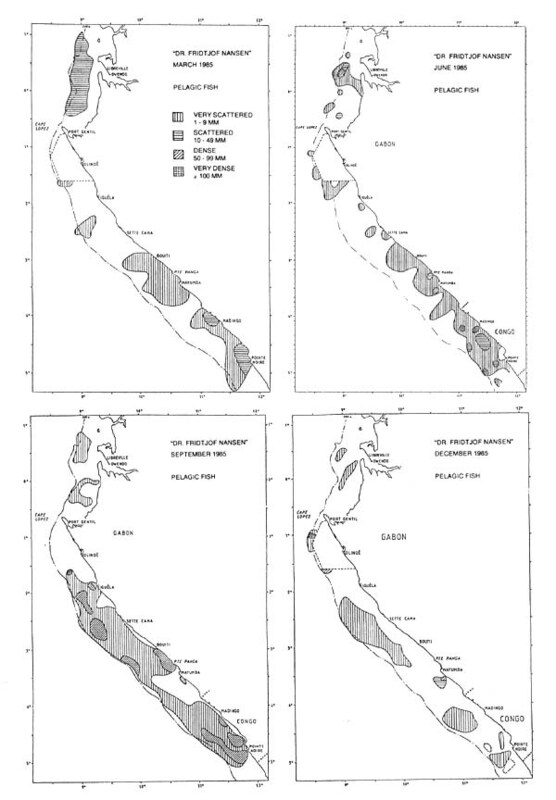 Figure 7.27 shows the distribution of pelagic fish for the four surveys in 1985. This may be representative of the seasonality in fish availability and distribution. During the March 1985 survey, pelagic fish appeared to be very scattered and consisted mainly of Pelagic type 2 species. Sardinella was caught only on a few occasions. The pelagic recordings north of Cape Lopez were identified as triggerfish (Balistes capriscus) and in March 1985 the biomass was estimated at 52,000 t. However, this species decreased sharply in the May-June 1985 surveys (15,000 t) and disappeared thereafter. During the September 1985 survey (corresponding to the winter season) dense aggregations of pelagic fish were found over the whole shelf. The increase was mainly due to juvenile stages of horse mackerel and round sardinella. No triggerfish was recorded during this survey. This pattern is probably due to a seasonal effect, with triggerfish migrating southward from the Gulf of Biafra following the northern branch of the SEC during the summer season and migrating northwards, at the onset of the winter season. The most remarkable feature of the Table 7.79 is the marked increase in biomass September 1985 as compared to the two previous surveys. Most of the biomass consisted of juvenile stages (<20 cm total length) of horse mackerel and sardinellas. The inshore waters south of Cape Lopez serve in fact as a nursery ground for these species. With increasing size their distribution range expands both seawards and along the coast (Ghéno and Fontana, 1981). The sharp increase in biomass may be due to the movement of recruiting fish to the open shelf from the shallow coastal waters that are inaccessible to the DR. FRIDTJOF NANSEN. The main spawning grounds are probably located further south, off northern Angola and Congo. Eggs and larvae are transported northwards and to the shallow coastal areas by a cyclonic movement of surface currents. The main resources of small pelagic fish in this region appear therefore to be shared by Angola, Congo and Gabon. The presence of immature individuals of both sardinellas and horse mackerel along the Angolan coast, as far south as Lobito, indicates, however, that spawning probably takes place all along the coast. A study of the bottom fish communities of the shelf and slope off southern Gabon (from Cape Lopez) and Congo, based on the 1989 surveys (Bianchi, 1992d), showed that the main environmental gradient along which faunal changes take place is depth. A sharp faunal discontinuity is located between the shelf and the upper slope, due to the steepness of the shelf edge. Another “environmental boundary” is represented by the area where the thermocline impinges on the shelf, effectively separating the shallow-water communities from the mid-shelf communities. Clear differences were found, within similar depth ranges, between the communities off the two countries. Two main shallow-water communities were identified off Gabon: species typical for sandy bottoms, like blue-spotted seabream (Sparus caeruleostictus), stingray (Dasyatis margarita), spiny lobster (Panulirus regius) and spiny turbot (Psettodes belcheri) while off Congo, where a soft mud-clay bottom prevails, the shallow waters were dominated by the eurybathic bumper (Brachydeuterus auritus), the croakers (Pseudotolithus senegalensis) and (P. typus), the threadfins (Galeoides decadactylus) and (Pentanemus quinquarius) and hairtail, (Trichiurus lepturus). Also the sub-thermocline communities differed, with a typical “sparid community” off Gabon (with representatives of the family Sparidae accounting for more than 40% of the catches), while Brachydeuterus auritus made up 55% of the catches in the corresponding community off Congo. It should be noted however that Durand (1967) reported Dentex angolensis as the dominant species of the deeper shelf (sub-thermocline) community off Congo. Therefore, the observed differences in species composition may not only be caused by differences in substrate, but also be the result of the respective exploitation regimes in the two countries. Table 7.80 presents the biomass estimates of demersal fish derived from the DR. FRIDTJOF NANSEN survey in 1981, based on an acoustic estimate, in 1985, as average of the four surveys and of the May-June survey in 1989 (no biomass estimate is available for the January-February 1989 survey). These latter estimates are based on the swept-area method. No great seasonal changes were observed in the bottom fish densities during the 1985 survey programme. The sharp drop between the 1985 and the 1989 estimate is therefore quite remarkable and apparently this applies to both countries.